The wheels of the Wayfair decision are turning across the U.S.
Federal tax changes had a ripple effect across many states in 2018. In fact, 13 states saw net increases to their sales and use taxes, as stated by a recent report from the National Conference of State Legislatures. In comparison, 10 states reported net decreases. While relatively on track with trends in recent years, these changes accounted for the most significant net tax increase at the state level, up by $847.1 million. According to the report, 2018 proved to be a year of many challenges and opportunities in regards to taxes. “States grappled with major federal changes, continued phasing in their own reforms, and made new changes that altered their own landscapes,” the report noted, resulting in net revenue changes that were overall minimal. As a consequence, these landmark changes will force states to review their current practices and decide if updates are needed to accommodate the new rulings. In particular, the Wayfair decision will likely have an impact on the taxes of every for-profit and nonprofit organization, necessitating increased costs for goods or services as well as a greater need for due diligence if online sales continue to rise. In the realm of sales and use taxes, remote sales taxation was at the forefront of conversation. With the $847.1 million net tax change, all tax categories – except for personal income taxes (down $44.2 million), alcoholic beverage taxes (no change) and health-care-related taxes (down $3.8 million) – saw increases. The states incurring the largest increases in sales and use tax were Louisiana, Kentucky and Georgia, respectively. According to the report, “Louisiana’s $466 million increase was a result of the additional sales tax rate extension.” The additional rate was extended at a reduced rate of 0.45 percent. Kentucky’s sales and use tax increase was due to the expansion of its base to include remote sales. The state reported an estimated revenue increase of $192.5 million for fiscal year 2019, but the change is expected to add an additional $3.2 billion to the state’s sales and use tax base. Similarly, Georgia projected an increase of $113.9 million in sales and use tax revenues, primarily due to legislation creating an economic nexus to include remote sales. Eight states (Georgia, Kansas, Kentucky, Louisiana, New Jersey, Oklahoma, Oregon and Rhode Island) and the District of Columbia increased their net taxes by more than 1 percent. While these changes in taxes were driven mainly by developments that occurred outside of state legislatures, the result will mean a shift in policies for many states in 2019. As states consider their options and implement regulations on the collection of sales tax for online/remote sales, we’ve added four to our list of those adopting the same or similar economic nexus thresholds for sales and use tax collection purposes: California, New York, Texas, and Washington D.C. Effective April 1, 2019, out-of-state retailers selling above certain economic thresholds into California will be required to collect California use taxes on their sales into California. The retailer makes sales for delivery into California in 200 or more separate transactions. Has conducted more than 100 sales of tangible personal property delivered into the state. Beginning October 1, 2019, Texas will begin enforcing a requirement that remote sellers engaged in business in Texas are subject to tax if their total Texas revenue in the preceding twelve calendar months is greater than $500,000. Have more than 200 separate retail sales delivered into D.C. Questions about sales and use tax updates? Please contact James Ortiz in our State and Local Tax Department at 505-998-3468 / jortiz@redw.com. 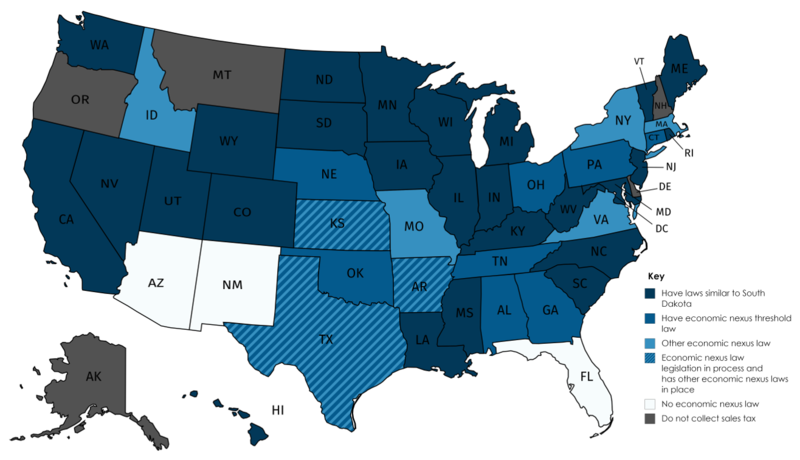 REDW maintains both a map of U.S. states and a comparison chart that provides details on each state’s current economic nexus status. Does the South Dakota v. Wayfair Decision Mean Economic Opportunities for Tribes?